I finished "Farm City" last month and realized I had a book with a very similar title on my bookshelf. You can see where my interests lie. I really dug "Farm City. "* Novella is just the perfect amount of weird for this kind of memoir. I felt for her neighbors though, especially when she raised pigs in an urban lot. But she's one tough cookie, snapping the necks of rabbits and digging through dumpsters outside of Chinese restaurants for leftovers for her livestock. 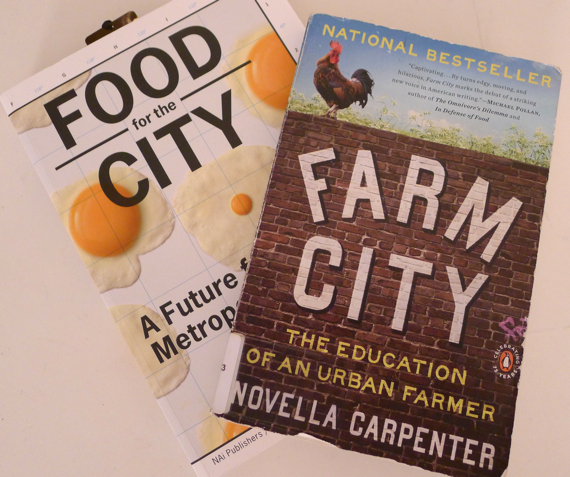 Novella, write another book and until then I'll keep up with your blog and live vicariously through your urban farming. Posted in Books and Movies and tagged with Farm City. July 24, 2013 by Adele Chapin.